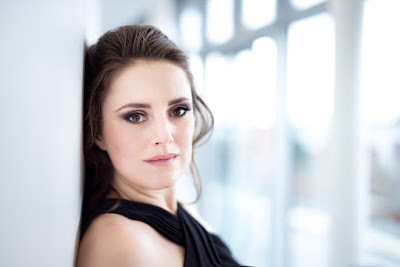 Richard Strauss's songs formed soprano Louise Alder's recent debut disc [see my review], so it is not surprising that the composer's song should feature on her programme with pianist James Baillieu (piano) at the Wigmore Hall on Saturday 20 January 2018. Under the title Chants d'amour we had songs by Mozart, Bizet, Richard Strauss and Mendelssohn, plus Faure's Cinq melodies de Venise and Liszt's Three Petrarch Sonnets S270/1. Alder and Baillieu's performance made the most of Mozart's deceptively simple songs, An Chloe, Abendempfindung and Der Zauberer; the first full of charm, the second quietly concentrated and the third a characterful narrative. There was a nice vibrancy to Alder's lyric soprano and she phrased the songs beautifully, supported by Baillieu's poised playing. Bizet's songs are not as well known as they should be, and the best of them show the French chanson's development towards something richly complex. Chant d'amour had a vibrant yet fluid line, with both performers giving sense of impulsive flow in the piece. For some reason, despite a conventional French text, Ouvre ton coeur was very Spanish, but both Alder and Baillieu brought out the delightful character of the piece. Adieux de l'hotesse arabe is perhaps one of the best known of Bizet's songs, and Alder was all haunting, seductive charm here, shaping the line gorgeously and Baillieu brought a similar lightness to his piano playing. The result was very affecting. The French language seemed to suit Alder's voice, and I hope that opera managements were taking note. The first half concluded with a group of Richard Strauss songs, rather than give us a random selection Alder and Baillieu very sensible opted for Strauss's Opus 27 group, which starts with Ruhe, meine Seele! and ends with Morgen!... The fascination of this group is partly that it was a wedding present for his wife, and partly the fact that Strauss chose to set two poems by John Henry Mackay, a writer whose work would later become explicitly homosexual, though this theme is already implicit in the poems [see my article, Richard Strauss and the gay sensibility]. Alder has a lovely voice, but clearly does not simply luxuriate in it, and each song she sang was carefully thought through and projected, this was very clear in the Strauss where she certainly did not simply let the voice float away gorgeously, but brought out thoughtful details. Ruhe, meine Seele! started with Baillieu's dramatic piano introduction, and Alder then made the song highly concentrated, growing in intensity till it was almost disturbing, with a bleak ending. Cäcilie flowed impulsively, becoming highly passionate, whilst in Heimliche Aufforderung the lovely ease in Alder's upper register was finely apparent. This latter song was highly engaging, with Alder and Baillieu bringing out the emotional narrative. Finally Morgen!... which was sung on a thread, highly concentrated yet lyrical, with a sense of the underlying melancholy of the piece. Alder and Baillieu opened the second half with further neglected gems, a group of songs by Felix Mendelssohn; granted his lieder are rarely as deep as those of his great contemporaries, but they are always beautifully written and frequently deeper than they appear at first sight. Gruss was short but finely crafted and rather melancholy. Auf Flügeln des Gesanges (On wings of song) is of course the best known of Mendelssohn's songs. Beautifully flowing, Alder's performance showed lovely control of the phrasing. Finally the delightful Neue Liebe which was very much Mendelssohn in fairy mode. Gabriel Faure's Cinq Melodies 'de Venise' Op.58 were started in Venice and the set contains Faure's greatest settings of Verlaine. Mandoline's lightly characterful piano complemented Alder's performance, elegantly laid back but full of detail. En sourdine started with Baillieu's fluid piano which supported Alder's calm yet imaginative vocal line. Green was light, mobile and poised, whilst A Clymene had a hypnotic beauty to it as intensity grew. C'est l'extase was also slow build, with a lovely ease in the seductive details. Alder and Baillieu made each song flow fluidly, with a nice suppleness of line, but I would have liked Alder to dig into the text more, to make the poetry count as much as the music. Franz Liszt's Three Petrarch Sonnets were written for tenor and piano, in fact the greatest tenor of the age Giovanni Batista Rubini. Rubini was renowned for his performances of Bellini and Donizetti, and Liszt's songs are arias in everything but name, channelling Liszt's elaboration of the style of Bellini. I have to confess to finding the transposition to female voice a little unsatisfactory, the pieces really do seem to explore the very particular high intensity of the high tenor register. In Pace non trovo Alder and Baillieu started well, with a particularly strong recitative, and when the big tune came in it was sung with lyric intensity and a lovely melancholy. Here, Alder really did bring out the words as well. Benedetto sia 'l giorno was confiding at first, but building. Whilst Alder gave us a lovely cantilena, there was emotional engagement too. The final song was pure Bellini, albeit in a supercharged way. Alder sang with an elegant sense of line, real identification and a lovely ease at the top, but I still missed the tenor voice. Baillieu was a superb partner, taking Liszt's elaborate, virtuoso piano writing (hardly an accompaniment at all) in his stride. This was a lovely, thoughtful recital with an imaginative mix of well-known and lesser known song. Throughout Alder sang with great lyrical beauty and a sense of engagement with the songs, full of felicitous details. But sometimes I felt there was a little too much control, and wanted her to relax and let her personality shine a little. How this could happen was demonstrated in the encore, Delibes' Les filles de Cadiz which was sung with such delight and abandonment.